cutesherry-san has scanned (EDITED on 31/01/2009: scans no longer available) the goodies that come with the limited CLAMP in CARDLAND PARTICULAR BOX. 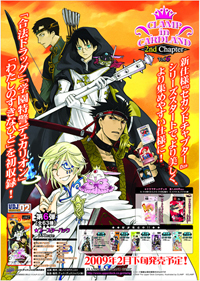 It includes scans of the cover (new illustration) and the two clear files featuring Kamui & Subaru and Vampire Fye. She also scanned things from the 5th Series. 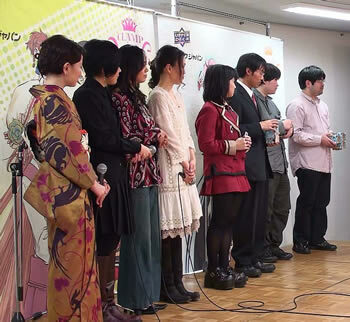 Last week I posted a picture from the CLAMP Talk Show that was held in Tokyo, this week I’m posting a picture from the Osaka event (Dec. 21) that was recently added to CLAMP in CARDLAND’s official website. From left to right, we have: Mokona, Tsubaki Nekoi (sporting her new, shorter haircut), Satsuki Igarashi and Nanase Ohkawa (with a very p!nk dress xD). In this picture they are talking about a card of Fye and Primera. 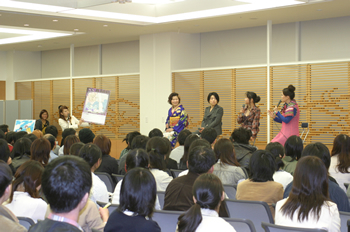 There are other pictures from the Osaka convention here, but so far no pictures of CLAMP’s Talk Show from that day. (Sorry for the size. Maybe I should put it behind a cut? ^^;;; Sorry if it’s causing any chaos in your Friends page). On the left, Point Card Time to Play with Snow, on the right, Secret Card Time to Admire Snow. The website also has a very brief report of the 2nd Official Event that was held in Tokyo on the last 23. It doesn’t cover CLAMP’s Talk Show, unfortunately. The 6th Series of CLAMP in CARDLAND goes on sale in February. 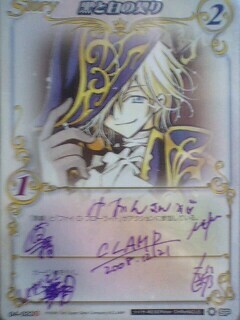 Fresh news from the CLAMP Talk Show that was held in Tokyo yesterday, at the CLAMP in CARDLAND 2nd Official Event. When asked about Kobato. anime, Ohkawa said that she “can’t tell yet” any information about it. More information on CLAMP’s Talk Show and the possibility of a Kobato. anime as they come, stay tuned! According to this month’s installment of Kobato. News!! section in Newtype, there will be some “big announcement” about Kobato. in the next issue of the magazine. It also says that this month’s installment of Kobato. News!! was the last one. It says information about Kobato. will still be published in Newtype, just no longer in Kobato. News!!. For now, I would bet on a music video! Wouldn’t it be great? 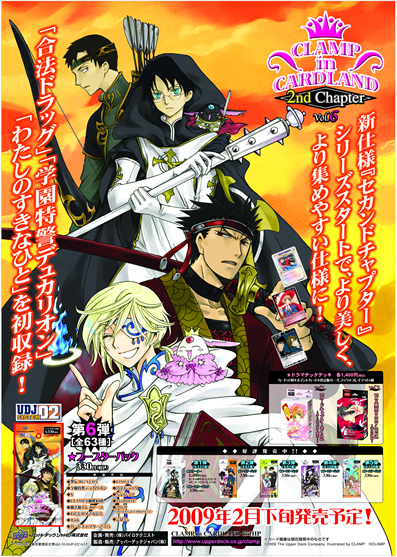 Newtype says the Tosho Card illustration will be drawn by CLAMP, I wonder if it’ll be one of those illustrations with anime coloration. Also, I don’t understand why they are ending Kobato. News!! if information about Kobato. will still be published in Newtype anyway. Will CLAMP use that extra page to make longer chapters?